* ABS FC has signed Otegbeye Ajibola (born 22.10.1993), a striker or winger, formerly of amateur club Vela FC and Kwara United FC. Ajibola made a goal-scoring debut against El-Kanemi Warriors FC on 09.05.2013. Since his debut, Ajibola has made substitute appearances against Sunshine Stars FC and Sharks FC. * Midfielder Joseph Bassey has been “promoted” from second level side Akwa Starlets FC to Akwa United FC. * Akwa United FC has signed Emmanuel Enize, a striker or winger, well-known in Nigeria for several good seasons at Ocean Boys FC, as well as a rather uneventful stint at Sharks FC during the Nigeria Premier League 2012. Enize scored his first goal for Akwa United FC against Rangers International FC on 15.05.2013. * Kelvin Njoku (born 10.05.1984) is an experienced left-back or defensive midfielder, formerly of Enyimba FC, Niger Tornadoes FC and Gombe United FC. Njoku has recently joined Akwa United FC. * Bayelsa United FC has signed Junior Salomon (born 04.08.1986), a Nigeria-born centre-back who is a full international player for Benin. Salomon played 13 matches for ASEC Mimosas during the Ivorian MTN Ligue 1 2012. Salomon has already played two matches for the Yenagoa-based side. * Dolphins FC has re-registered defensive midfielder Osita Echendu (born 04.02.1987). Echendu has been with Dolphins FC for at least three seasons and has played three matches since his comeback, including one substitute appearance. * Nembe City FC will miss centre-back Baker Ebiabowei. After an impressive start to the new season, Ebiabowei, formerly of Bayelsa United FC, decided to join Dolphins FC. Ebiabowei made his debut for Dolphins FC on 15.05.2013 against Kaduna United FC, making an substitute appearance. * El-Kanemi Warriors FC has signed goalkeeper Asemome Alloy who last season starred for second level side FRSC Strikers FC. * Cameroonian striker Junior Rafael Boumsong has joined El-Kanemi Warriors FC from Chadian club Gazelle FC. * El-Kanemi Warriors FC could have made a smart signing in the powerful Ebube Okpokwu, a star player at second level side Abia Comets FC. Okpokwu scored two goals in his debut against ABS FC on 09.05.2013. * El-Kanemi Warriors FC has re-registered striker Ezekiel Thompson. Thompson, who scored in his first match of the season (09.05.2013 against ABS FC) scored seven goals when El-Kanemi Warriors FC won promotion to the Nigeria Professional Football League last season. * Kwara United FC has signed Yahaya Adamu (born 17.07.1993). The 19-year old striker joins from Sunshine Stars FC. Adamu made a goalscoring debut against El-Kanemi Warriors FC on 12.05.2013. Last season, Adamu scored six goals for Rising Stars FC and made his debut for the Nigeria U-20 national football team. * Defensive midfielder Afeez Awakan is another new player at Kwara United FC. Awakan, formerly of FC Ebiede, played a couple of matches for Shooting Stars FC last season. * Lobi Stars FC was shocked by second level side Apa United FC during a recent match in the Benue State Federation Cup. Apparently, the Makurdi-based side has signed several players from the cup heroes, including Douglas Achiv, John Abah Eyimonye and Daniel Nyor. Eyimonye was the captain of Apa United FC and one of the leading scorers at the club. * According to unconfirmed sources, Uche Ugochukwu has left Nembe City FC and joined Nasarawa United FC. Ugochukwu has scored two penalty goals for Nembe City FC this season. * Adeyinka Michael Adedeji (born 25.03.1985), the left-back or left-winger who played professionally for GIF Sundsvall (Sweden) and Pyunik Yerevan (Armenia), has joined bottom side Sharks FC. 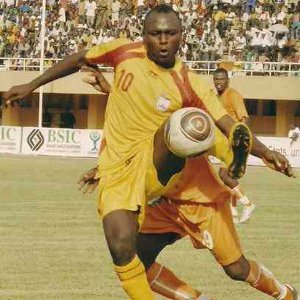 * Striker Gabriel Agu (born 15.06.1985) scored eight goals for Crown FC during the Nigeria Premier League 2010-2011, but was not a success at Enyimba FC last season. Agu has recently joined Sharks FC. * Last season, striker Tayo Fabiyi shown promise at Kwara United FC before joining Rangers International FC during the mid-season transfer window. Fabiyi has now joined Sharks FC. * Christian Ifeanyi Inyam (born 20.12.1991), a pacy striker with a healthy workrate and a lot of strenght, has also joined Sharks FC. Inyam is a former player of ASEC Mimosas and Sunshine Stars FC. * Isaac Loute, the strong striker formerly known as “Luther James”, is another new signing at Sharks FC. Loute is a full international player for Benin. He played top level football for Gateway FC during the Nigeria Premier League 2009-2010. The picture is of Loute and was found on www.naijapremierleague.net. * Anthony Okemmiri is a great signing for Sharks FC. Okemmiri, a versatile player, perhaps most effective at the right-wing, played for Kwara United FC last season. Okemmiri is known for dribbling ability, strenght and speed. * Last season, centre-back Francis Edem captained second level side First Bank FC. Edem has now joined Shooting Stars FC and has already played two matches in the heart of the 3SC-defence. * Big striker Henry Osita is a new signing at Sunshine Stars FC. Last season, Osita played for Wikki Tourists FC and Rangers International FC. * Veteran striker Ibrahim Abubakar Babale (born 12.01.1980) has returned to his former club Wikki Tourists FC. Babale struggled at El-Kanemi Warriors FC during the first eight matches of the new season.